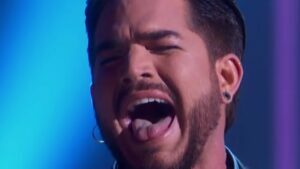 Adam Lambert is known for the moving performances that are going to touch your heart right away, but this time, he really exceeded the expectations of the viewers and proved that he is indeed one of a kind when he appeared at the Kennedy Center to pay his respects to Cher and her talent. The viewers have already decided that Adam is one of the most underrated vocalists across the country. The fans love him dearly, but since they do not always have an opportunity to visit the concerts, they vote for the performance to appear on public television more often. This was the time for Lambert to shine, and he proved that he is a singer with a reputation when he provided the crowd with the rendition of the month. “Believe” is the kind of song that will literally blow your mind, and the singer did his best to stand out among the others and show us that he values Cher almost too much. The touching rendition got millions of views on the social media, and you will understand the reason for this the minute you see the vocalist below. He earned fame due to the appearance on the American Idol which was Adam’s first ticket to the world of show business, but surely, this was just the beginning of his path to the marvelous achievements as the vocalist proved that he deserves all the titles and awards that are bestowed on him at the moment. You will find yourself watching the clip again and again, and we are certain that the man was honored to appear at the center and belt out the words of the composition that can already be called legendary. The reaction of Cher is something that needs to be discussed as well because the celebrity did not hesitate to show that she definitely appreciates the cover that was presented to the crowd. This is the reason we respect Lambert for his ability to retain the original meaning of the song while being respectful to the original performer. This is the kind of rendition that deserves your attention, and we are waiting for you to discover out below and immerse in the world of sound together with the audience!